With his performance the Japanese Takahiro Suzuki adds life to the 4th Festival of young experimental Art. Since the beginning of May, he fills sheets of paper with only one single word "IKIRO" which means "Be Alive". Therefore the 33 year old man stimulates the visitors right at the entry of the exhibition. Thousands, maybe several thousands of sheets - and now, at the end of of the festival the amount of paper is infinite. Visitors coming to see t he exhibition during the last days are virtually overwhelmed. Around him, heaps of rice paper with one similarity, from top to the bottom they are filled with one word - IKIRO! 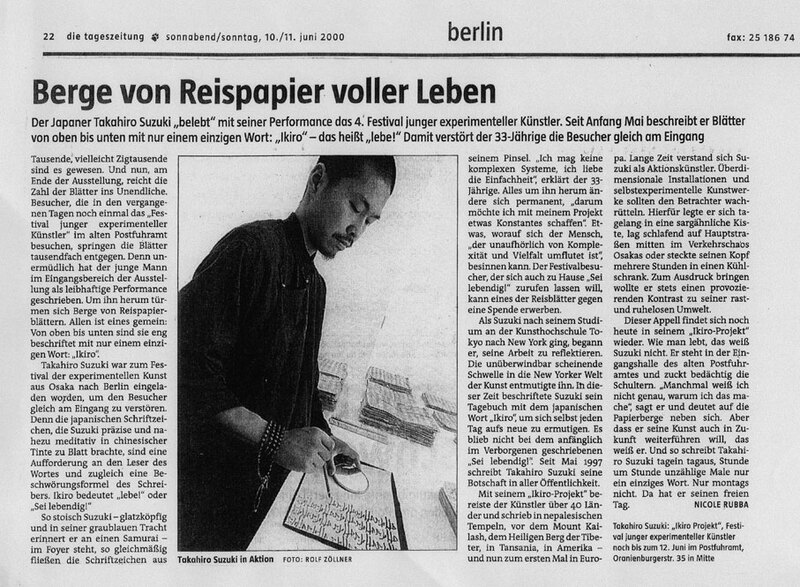 Takahiro Suzuki from Osaka was invited the 4th Festival of young experimental Art in Berlin, to stimulate the visitors right at the beginning, because the Japanese writing that Suzuki adds precisely and nearly meditative to the paper with chinese ink, is a request to the reader and the incantation of the writer one. "IKIRO" means "Be Alive". As stoic as the shaven headed Suzuki, dressed in a gray blue costume reminding of a Samurai, stands in the entry, as equal flows the writing out of his brush. "I don't like complex systems, I love the simplicity. ", explains the 33th years old. Everything around him changes permanently, therefore I want to create something constant with my project that people who are permanently surrounded by complexity and variety can think of it. The visitor of the festival, who wants to hear/ keep "Be Alive" at home, can get one of the sheets by giving a little donation. After finishing his studies in the art school of Tokyo, Takahiro Suzuki left for New York and started to reflect on his work. To take the step into New York's art world seemed like impossible to him and very discouraging. During this time he used to write IKIRO in his diary to encourage himself everyday. But it didn't stay in only secret writing. Since 1997 Takahiro Suzuki writes his message in public. With the IKIRO project he traveled through 40 countries and wrote at the temple in Nepal, in front of Mt.kailash - the holly tibetan mountain, in Tanzania, in America, and now for the first time in Europe. For a long time Takahiro Suzuki understood himself as an artist of action, over dimensional installations and self-experimental artworks should s hake the people up. To achieve that, he lay in the coffin-like box for several days or slept on the main roads in the middle of Osaka's traffic chaos, or put his head into a fridge for hours. He always wanted to express a provoking contrast to his lest less environment. This purpose is still part of the IKIRO project. How to live, Suzuki doesn't know. He stands in the hallway of the postfuhramt and shrugs his shoulders. "Sometimes I don't really know why I do this." He says and points at the heaps of paper. But he definitely knows that he wants to continue his art work. Therefore he writes day after day only one single word - except Monday which is his day off.